"Mr. Cork, how have you ALIGNED your workshop to fit OUR State's Writing Test and OUR Scoring Rubric?" After 25 years of creating academically enriching environments in 44 states and 5 foreign countries, I truly appreciate this question. 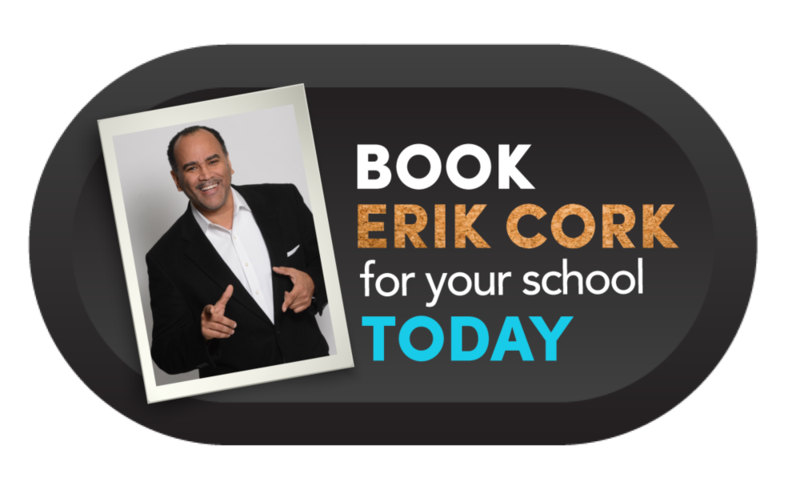 My unique workshop is where passionate and entertaining ELA instruction intersects with superior student engagement, high education expectations, teacher enrichment and parental participation. My energetic approach and unbridled enthusiasm for writing is infused into the hearts of my coast-to-coast audiences. I strictly forbid and frown upon formulaic writing approaches when it comes to various modalities of written expression. I place a heavy emphasis and a rhythmic spotlight on the state syllabus that incorporates logic, structure, vocabulary, grammar, mechanics and proven pedagogical practices. I joyfully celebrate a balanced approach to teaching and learning. I do not lecture, nor do I distribute cookie-cutter worksheets because my original, authentic material and live instruction showcase the power and beautiful ballad of the writing process. I am not offended by accountability audits of my gift to keep students engaged for six (6) straight hours. I challenge anyone on any level, anywhere on planet earth at any time to do likewise in front of 500,000 students and teachers for over 20 consecutive years. Yet, I am often interrogated and quizzed, sometimes more than others. I love it! Concerns regarding my willingness to adapt as a nationally recognized literacy consultant are obvious indications that serious administrators are well aware of the fact that I conduct a plethora of PD seminars and student assemblies in states other than their own. I do not take it personally when qualified professionals want to be reassured that I speak the preferred ELA language of their particular state. Administrators and classroom teachers wish to confirm that I comprehend the literacy standards that students in their district and local community are required to know and masterfully apply in order to pass specific state standardized writing exams. Key decision makers are naturally curious to know if I am cognizant of the phrase “common core,” as well as their agreement or obstinate opinions regarding that phrase being spoken during my seminars. I embrace the fact that students must compose coherent essays that please human beings, as opposed to lifeless, scantron machines built to quickly calculate millions of multiple choice answers on math and reading exams, but not actual written words. Living, breathing people must read, analyze, critique and evaluate hand-written student essays based on rigorous writing rubrics published on each state’s public website. It is my artistic pleasure to modify and customize my constantly updated workshop according to each state’s most current research data. I delightfully discuss and disseminate non- traditional techniques to inspire young scholars to achieve rigorous state writing mandates. I am keenly aware that cautious administrators who have yet to personally experience the pleasure of absorbing the strategies of my lively session with students and staff want to be assured that CURRICULUM COMES FIRST (before fun and entertainment). They desire validation and guarantees that higher order thinking skills and performance assessment criteria tailored to how aggregated data is measured and interpreted will be respected and adhered to by me and reflected in my all-day seminar. Simply stated, no one does it better than yours truly. My goal is to make a positive, lifelong impact as it relates to the ART of writing and creating a permanent craving and satisfaction for the sound of one’s unique voice being transferred to blank pieces of paper.